The 009 Society AGM and the biennial NG South, organised and hosted by the Wessex NG Modellers, was this year the biggest NGS ever and possibly the largest specialist one-day NG modelling event there has ever been (so far). With it being predominately an 009 event, naturally the smaller scales were in the majority, but there were still 9 larger scale layouts, mainly 7mm, not including the additional ones provided by traders. In the 3½ and 4mm scale families there were no less than 27 layouts! OK, "biggest" is not always "best", but the general feedback certainly indicated that the popular feeling was that Sparsholt this year was indeed "best" - many of the layouts were classics in their own right and have appeared at other shows individually as "the star layout" - to have so many coralled together at once was absolutely fantastic. 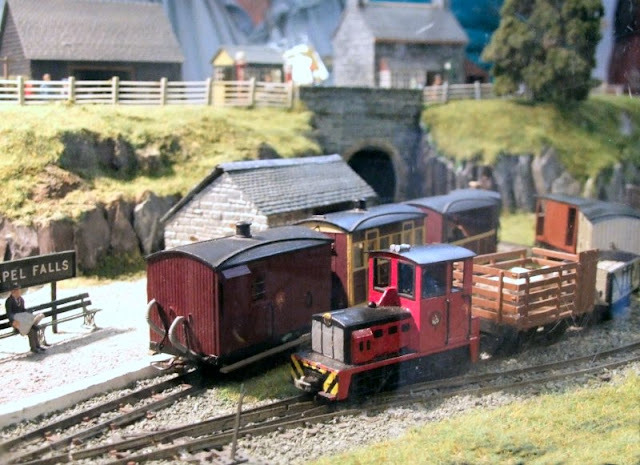 In addition and to provide variety there were also many layouts on show for the first time, some of which such as John Thorne's new Purbeck are surely destined to become highly sought after by exhibition managers seeking crowd-pulling attractions in the future. A great day and special thanks to the Wessex NGM Committee, in particular the show organiser, Howard Coulson, for laying on such a marvellous opportunity to gather together some of the most popular NG layouts that exist, all under one roof at the same time. Obviously with a show this big and only a few hours available to get round, some compromises have to be taken and in my case it was one of abandoning the tripod and remote shutter cable and rushing around taking opportunistic snaps of as much as I could. Consequently some of the photos are not "my best results" but I decided that on this occasion, quantity would be better than attempts at quality, so here is my selection of over 100 snaps in a quest to try to show a selection of as many of the layouts that attended as possible. I hope you enjoy them!